Jeez, UTC is very challenging prep. Slowly working through the very fragmented nature of the bone, but luckily the matrix is also fairly soft. We are, however, using a lot of consolidants to keep everything together. It's really interesting to see how things are taking shape now that we have prepared pieces that are starting to fit together, such as the right front arm. Below is a pic of the coracoid, humerus, ulna, meetacarpal and phalanx that we have finished. After taking measurements and scaling them to the AMNH's Centrosaurus skeleton, it appears that our critter will be a hair over 6m long (19.5 feet) if it were complete. We're always working on a bunch of different things at the same time, so just for Saurian, we'd like to announce we've started baby steps towards working on our Daspletosaurus Pete III again. Jacob is working on a block that had a fibula, distal tarsal, and 5 articulated mid-caudal vertebrae in it. Hopefully by the end of the day tomorrow everything will be finished, and that's one more big jacket off of the shelf! We begin week #2 of our prep efforts with renewed energy! The more we work on it, the more neat stuff we find. Case in point the jacket labelled "?tibia" turns out to be a complete right humerus, with a total length of 70cm. An ulna and fibula have also turned up, and field sketches seem to show a femur. This appears to be a fairly large centrosaur, approaching the size of our Triceratops prorsus skeleton "Gundy". 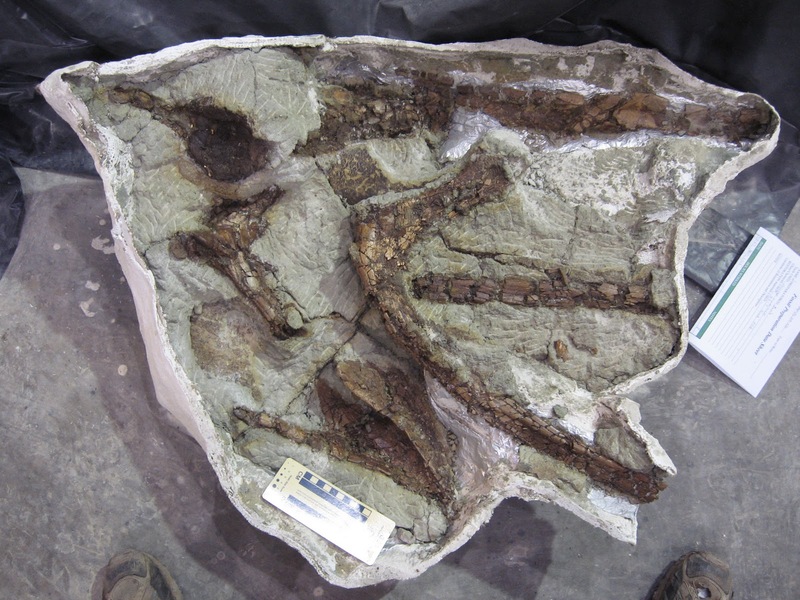 If any of you researchers have good PDF references on centrosaurs, please contact me, I don't have library access so modern papers are relatively difficult to come by. Other jackets are showing they have much more in them than what was recorded in the field notes. 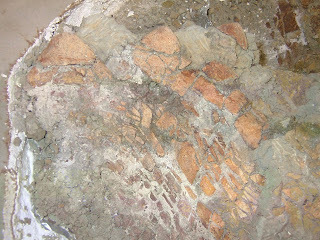 The jacket below looks to contain a predentary, several ribs, and a least one strange unknown (as of yet) element. We should know soon though! All kinds of stuff in there. We restarted work today on a dinosaur project that I'm actually pretty excited about. With the new discoveries from Utah, it looks more and more like the ceratopsian dinos of the Campanian are very specific to geographical area, in addition to stratigraphic level. For us working in the Judith River that means that you can maybe find Avaceratops and Monoclonius, according to the now seemingly dated conventional wisdom. 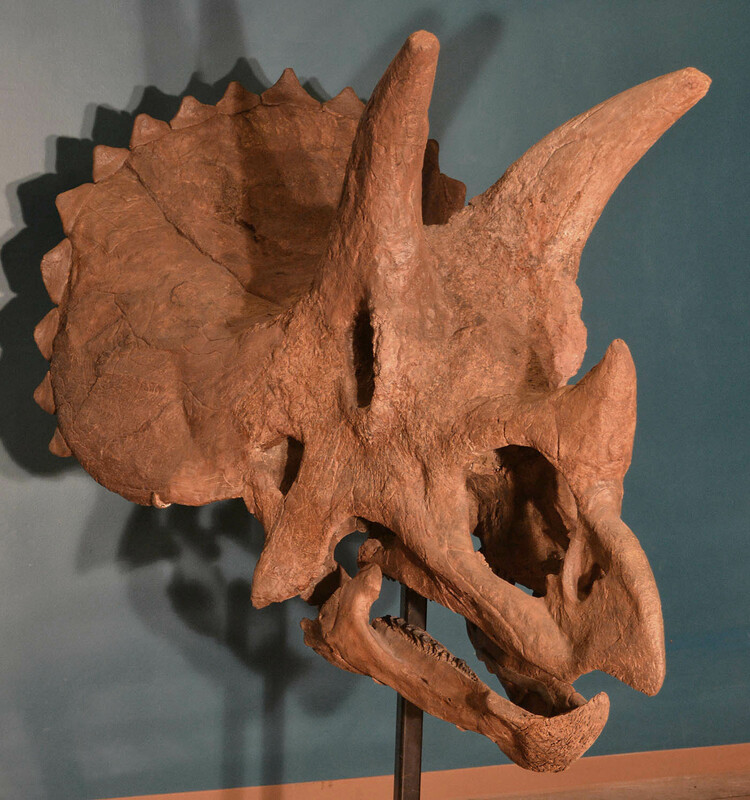 Except that a new specimen of Ceratops montanus was recently discovered near our dig areas. And we've found things that look a heck of a lot like Anchiceratops. And Styracosaurus. 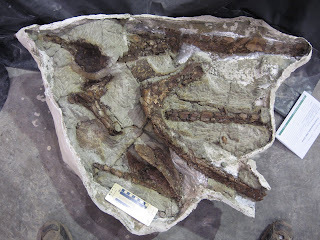 And bits of a big honkin thing that looks a bit like the newly described Kosmoceratops. Oops. What a mess. The critter we're working on now is a centrosaurine nicknamed "UTC". It was discovered in 2004, and has sat on our shelves for much of the in-between time. It's time to knock out the prep. Unfortunately the specimen was discovered coming out skull first, with those parts slumping slowly downhill. It's going to be an interesting challenge getting it back together. The parts that we have are pretty interesting though, and as prep continues we may be able to get a good idea of what critter we have. Heck, based on the explosion of ceratiopsian discoveries in the past few years (and how most researchers avoid the Judith River Formation like the plague), there's even the possibility that this animal is a new species. We'll keep you updated on the progress as more bones get prepared.